Ever since my Dad made Sticky Chicken Wings, when he and my Mum were visiting, I have been wanting to have them again and again! Since they’ve gone back home to Australia now (sob sob) I knew that I had to replicate those wings, cause they are so darn good and bring back good memories too! Put oven rack in upper third of oven and preheat oven to 425°F (220 C). Line a large shallow baking pan with foil and lightly oil foil. Mince garlic and mash to a paste with salt using a large heavy knife. Transfer garlic paste to a large bowl and stir in soy sauce, hoisin, honey, oil, and cayenne. Add wings to sauce, stirring to coat. Wings can be left to marinate for a few hours over night or can be cooked straight away. Arrange wings in 1 layer in baking pan and roast, turning over once, until cooked through, about 35 minutes. 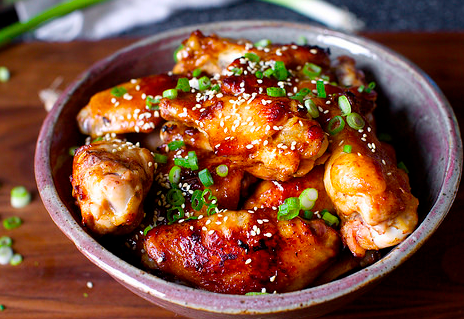 Transfer wings to a large serving bowl and toss with sesame seeds and schallot.